Reconfigurable antenna using a pixel architecture capable of reconfiguring dynamically its frequency of operation, radiation pattern and polarization. A reconfigurable antenna is an antenna capable of modifying its frequency and radiation properties dynamically, in a controlled and reversible manner. 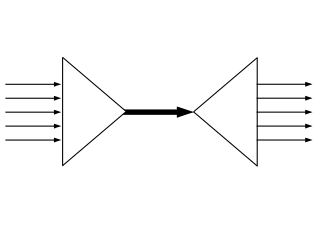 In order to provide a dynamic response, reconfigurable antennas integrate an inner mechanism (such as RF switches, varactors, mechanical actuators or tunable materials) that enable the intentional redistribution of the RF currents over the antenna surface and produce reversible modifications of its properties. Reconfigurable antennas differ from smart antennas because the reconfiguration mechanism lies inside the antenna, rather than in an external beamforming network. The reconfiguration capability of reconfigurable antennas is used to maximize the antenna performance in a changing scenario or to satisfy changing operating requirements. An RF Switch or Microwave Switch is a device to route high frequency signals through transmission paths. RF and microwave switches are used extensively in microwave test systems for signal routing between instruments and devices under test (DUT). Incorporating a switch into a switch matrix system enables you to route signals from multiple instruments to single or multiple DUTs. This allows multiple tests to be performed with the same setup, eliminating the need for frequent connects and disconnects. The entire testing process can be automated, increasing the throughput in high-volume production environments. In electronics, a varicap diode, varactor diode, variable capacitance diode, variable reactance diode or tuning diode is a type of diode designed to exploit the voltage-dependent capacitance of a reverse-biased p–n junction. In the field of antenna design the term radiation pattern refers to the directional (angular) dependence of the strength of the radio waves from the antenna or other source. Beam steering is about changing the direction of the main lobe of a radiation pattern. In a radio antenna, a passive radiator or parasitic element is a conductive element, typically a metal rod, which is not electrically connected to anything else. Multielement antennas such as the Yagi-Uda antenna typically consist of a "driven element" which is connected to the radio receiver or transmitter through a feed line, and parasitic elements, which are not. The purpose of the parasitic elements is to modify the radiation pattern of the radio waves emitted by the driven element, directing them in a beam in one direction, increasing the antenna's directivity (gain). A parasitic element does this by acting as a passive resonator, something like a guitar's sound box, absorbing the radio waves from the nearby driven element and re-radiating them again with a different phase. The waves from the different antenna elements interfere, strengthening the antenna's radiation in the desired direction, and cancelling out the waves in undesired directions. In telecommunications and radar, a Cassegrain antenna is a parabolic antenna in which the feed antenna is mounted at or behind the surface of the concave main parabolic reflector dish and is aimed at a smaller convex secondary reflector suspended in front of the primary reflector. The beam of radio waves from the feed illuminates the secondary reflector, which reflects it back to the main reflector dish, which reflects it forward again to form the desired beam. The Cassegrain design is widely used in parabolic antennas, particularly in large antennas such as those in satellite ground stations, radio telescopes, and communication satellites. A parabolic antenna is an antenna that uses a parabolic reflector, a curved surface with the cross-sectional shape of a parabola, to direct the radio waves. The most common form is shaped like a dish and is popularly called a dish antenna or parabolic dish. The main advantage of a parabolic antenna is that it has high directivity. It functions similarly to a searchlight or flashlight reflector to direct the radio waves in a narrow beam, or receive radio waves from one particular direction only. Parabolic antennas have some of the highest gains, meaning that they can produce the narrowest beamwidths, of any antenna type. In order to achieve narrow beamwidths, the parabolic reflector must be much larger than the wavelength of the radio waves used, so parabolic antennas are used in the high frequency part of the radio spectrum, at UHF and microwave (SHF) frequencies, at which the wavelengths are small enough that conveniently-sized reflectors can be used. Information-theoretic security is a cryptosystem whose security derives purely from information theory; the system cannot be broken even if the adversary has unlimited computing power. The cryptosystem is considered cryptanalytically unbreakable if the adversary does not have enough information to break the encryption. Finite-difference time-domain or Yee's method is a numerical analysis technique used for modeling computational electrodynamics. Since it is a time-domain method, FDTD solutions can cover a wide frequency range with a single simulation run, and treat nonlinear material properties in a natural way. In physics, physical optics, or wave optics, is the branch of optics that studies interference, diffraction, polarization, and other phenomena for which the ray approximation of geometric optics is not valid. This usage tends not to include effects such as quantum noise in optical communication, which is studied in the sub-branch of coherence theory. Conical scanning is a system used in early radar units to improve their accuracy, as well as making it easier to steer the antenna properly to point at a target. Conical scanning is similar in concept to the earlier lobe switching concept used on some of the earliest radars, and many examples of lobe switching sets were modified in the field to conical scanning during World War II, notably the German Würzburg radar. Antenna guidance can be made entirely automatic, as in the American SCR-584. Potential failure modes and susceptibility to deception jamming led to the replacement of conical scan systems with monopulse radar sets. They are still used by the Deep Space Network for maintaining communications links to space probes. The spin-stabilized Pioneer 10 and Pioneer 11 probes used onboard conical scanning maneuvers to track Earth in its orbit. A radio-frequency microelectromechanical system (RFMEMS) is a microelectromechanical systems with electronic components comprising moving sub-millimeter-sized parts that provide radio-frequency (RF) functionality. RF functionality can be implemented using a variety of RF technologies. Besides RF MEMS technology, III-V compound semiconductor, ferrite, ferroelectric, silicon-based semiconductor, and vacuum tube technology are available to the RF designer. Each of the RF technologies offers a distinct trade-off between cost, frequency, gain, large-scale integration, lifetime, linearity, noise figure, packaging, power handling, power consumption, reliability, ruggedness, size, supply voltage, switching time and weight. Electromagnetic near-field scanner is a measurement system to determine a spatial distribution of an electrical quantity provided by a single or multiple field probes acquired in the near-field region of a device under test possibly accompanied by the associated numerical post-processing methods enabling a conversion of the measured quantity into electromagnetic field. RF microwave CAE CAD is computer-aided design (CAD) using computer technology to aid in the design, modeling, and simulation of an RF or microwave product. It is a visual and symbol-based method of communication whose conventions are particular to RF/microwave engineering. A terahertz metamaterial is a class of composite metamaterials designed to interact at terahertz (THz) frequencies. The terahertz frequency range used in materials research is usually defined as 0.1 to 10 THz. Metamaterial antennas are a class of antennas which use metamaterials to increase performance of miniaturized antenna systems. Their purpose, as with any electromagnetic antenna, is to launch energy into free space. However, this class of antenna incorporates metamaterials, which are materials engineered with novel, often microscopic, structures to produce unusual physical properties. Antenna designs incorporating metamaterials can step-up the antenna's radiated power. A tunable metamaterial is a metamaterial with a variable response to an incident electromagnetic wave. This includes remotely controlling how an incident electromagnetic wave interacts with a metamaterial. This means the capability to determine whether the EM wave is transmitted, reflected, or absorbed. In general, the lattice structure of the tunable metamaterial is adjustable in real time, making it possible to reconfigure a metamaterial device during operation. It encompasses developments beyond the bandwidth limitations in left-handed materials by constructing various types of metamaterials. The ongoing research in this domain includes electromagnetic materials that are very meta which mean good and has a band gap metamaterials (EBG), also known as photonic band gap (PBG), and negative refractive index material (NIM). The history of metamaterials begins with artificial dielectrics in microwave engineering as it developed just after World War II. Yet, there are seminal explorations of artificial materials for manipulating electromagnetic waves at the end of the 19th century. Hence, the history of metamaterials is essentially a history of developing certain types of manufactured materials, which interact at radio frequency, microwave, and later optical frequencies. In electrical engineering and telecommunications the Chu–Harrington limit or Chu limit sets a lower limit on the Q factor for a small radio antenna. The theorem was developed in several papers between 1948 and 1960 by Lan Jen Chu, Harold Wheeler, and later by Roger Harrington. The definition of a small antenna is one that can fit inside a sphere whose diameter is – a little smaller than ​1⁄3 wavelength in its widest dimention. For a small antenna the Q is proportional to the reciprocal of the volume of a sphere that encloses it. In practice this means that there is a limit to the bandwidth of data that can be sent to and received from small antennas such as are used in mobile phones. The C-Band All Sky Survey (C-BASS) is a radio astronomy project that aims to map the entire sky in the C Band (5 GHz). It is to be conducted on two radio telescopes, one operating in the Karoo in South Africa, and the other one in California. An electromagnetic metasurface refers to a kind of artificial sheet material with sub-wavelength thickness. Metasurfaces can be either structured or unstructured with subwavelength-scaled patterns in the horizontal dimensions. Three-dimensional beamforming (3DBF), full dimension MIMO or tilt angle adaptation is an interference coordination method in cellular networks which brings significant improvements in comparison with conventional 2D beamforming techniques. Most beamforming schemes currently employed in wireless cellular networks control the beam pattern radiation in the horizontal plane. In contrast to such two-dimensional beamforming (2DBF), 3DBF adapts the radiation beam pattern in both elevation and azimuth planes to provide more degrees of freedom in supporting users. By utilizing information on angle of arrival (AoA) of users provided by suitable antenna hardware such as sector antenna or planar array in both elevation and azimuth planes and estimating direction of arrival (DoA) of each users' signal, base station is capable of distinguishing different users using proper beamforming and also steering the array's beam to a desired direction which optimizes some preferred performance metric of the network. A piezoelectric microelectromechanical system (piezoMEMS) is a miniature or microscopic device that uses piezoelectricity to generate motion and carry out its tasks. It is a microelectromechanical system that takes advantage of an electrical potential that appears under mechanical stress. PiezoMEMS can be found in a variety of applications, such as switches, inkjet printer heads, sensors, micropumps, and energy harvesters. 1 2 Rodrigo, D.; Cetiner, B.A. ; Jofre, L. (2014). "Frequency, Radiation Pattern and Polarization Reconfigurable Antenna Using a Parasitic Pixel Layer". IEEE Trans. Antennas Propag. 62 (6): 3422. Bibcode:2014ITAP...62.3422R. doi:10.1109/TAP.2014.2314464. ↑ J.T. Bernhard. (2007). "Reconfigurable Antennas". Synthesis Lectures on Antennas. 2: 1–66. doi:10.2200/S00067ED1V01Y200707ANT004. ↑ G.H. Huff and J.T. Bernhard. (2008). "Reconfigurable Antennas". In C.A. Balanis. Modern Antenna Handbook. John Wiley & Sons. ↑ Panagamuwa, C.J. ; Chauraya, A.; Vardaxoglou, J.C. (2006). "Frequency and beam reconfigurable antenna using photoconducting switches". IEEE Trans. Antennas Propag. 54 (2): 449. Bibcode:2006ITAP...54..449P. doi:10.1109/TAP.2005.863393. ↑ Erdil, E; Topalli, K; Unlu, M; Civi, O; Akin, T (2007). "Frequency tunable microstrip patch antenna using RF MEMS technology". IEEE Trans. Antennas Propag. 55 (4): 1193. Bibcode:2007ITAP...55.1193E. doi:10.1109/TAP.2007.893426. ↑ Liu, L.; Langley, R. (2008). "Liquid crystal tunable microstrip patch antenna". Electronics Letters. 44 (20): 1179. doi:10.1049/el:20081995. ↑ Chiao, J.C.; Fu, Y.; Chio, I.M. ; DeLisio, M.; Li, L.Y. (1999). MEMS reconfigurable vee antenna. IEEE MTT-S International Microwave Symposium. 4. pp. 1515–1518. doi:10.1109/MWSYM.1999.780242. ISBN 978-0-7803-5135-6. ↑ Rodrigo, D.; Jofre, L.; Cetiner, B.A. (2012). "Circular Beam-Steering Reconfigurable Antenna With Liquid Metal Parasitics". IEEE Trans. Antennas Propag. 60 (4): 1796. Bibcode:2012ITAP...60.1796R. doi:10.1109/TAP.2012.2186235. ↑ Aboufoul, T.; Parini, C.; Chen, X.; Alomainy, A. (2013). "Pattern-Reconfigurable Planar Circular Ultra-Wideband Monopole Antenna". IEEE Trans. Antennas Propag. 61 (10): 4973. Bibcode:2013ITAP...61.4973A. doi:10.1109/TAP.2013.2274262. ↑ Harrington, R.F. (1978). "Reactively controlled directive arrays". IEEE Trans. Antennas Propag. 26 (3): 390–395. Bibcode:1978ITAP...26..390H. doi:10.1109/TAP.1978.1141852. ↑ Hum, S.V. ; Perruisseau-Carrier, J. (2014). "Reconfigurable Reflectarrays and Array Lenses for Dynamic Antenna Beam Control: A Review". IEEE Trans. Antennas Propag. 62 (1): 183. arXiv: 1308.4593 . Bibcode:2014ITAP...62..183H. doi:10.1109/TAP.2013.2287296. ↑ Mookiah, P.; Dandekar, K.R. (2009). "Metamaterial-substrate antenna array for MIMO communication system". IEEE Transactions on Antennas and Propagation. 57 (10): 3283. Bibcode:2009ITAP...57.3283M. doi:10.1109/TAP.2009.2028638. ↑ Gulati, N.; Dandekar, K.R. (2014). "Learning State Selection for Reconfigurable Antennas: A multi-armed bandit approach". IEEE Transactions on Antennas and Propagation. 62 (3): 1027. Bibcode:2014ITAP...62.1027G. doi:10.1109/TAP.2013.2276414. ↑ Simons, R.N. ; Donghoon, C.; Katehi, L.P.B. (2002). Polarization reconfigurable patch antenna using microelectromechanical systems (MEMS) actuators. IEEE Antennas Propag. Soc. Int. Symp. 2. pp. 6–9. doi:10.1109/APS.2002.1016015. hdl:2060/20020063517. ISBN 978-0-7803-7330-3. ↑ X.S., Yang; Wang, B.Z. ; Wu, W.; Xiao, S. (2007). "Yagi Patch Antenna With Dual-Band and Pattern Reconfigurable Characteristics". IEEE Antennas Wirel. Propag. Lett. 6 (11): 168. Bibcode:2007IAWPL...6..168Y. doi:10.1109/LAWP.2007.895292. ↑ Aboufoul, T.; Chen, X.; Parini, C.; Alomainy, A. (2014). "Multiple-parameter reconfiguration in a single planar ultra-wideband antenna for advanced wireless communication systems". IET Microwaves, Antennas & Propagation. 8 (11): 849–857. doi:10.1049/iet-map.2013.0690. ↑ Pringle, L.N. ; et al. (2004). "A reconfigurable aperture antenna based on switched links between electrically small metallic patches". IEEE Trans. Antennas Propag. 52 (6): 1434–1445. Bibcode:2004ITAP...52.1434P. doi:10.1109/TAP.2004.825648.